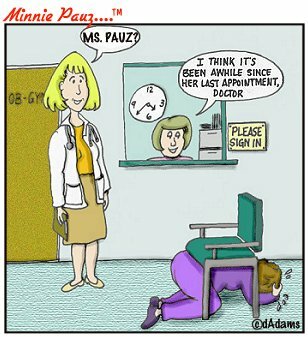 minniepauz.com - Why Oh Why didn't our doctors tell us? You are here: Home // Reading The Minnie Pauz Blog // Why Oh Why didn't our doctors tell us? Why Oh Why didn't our doctors tell us? No one seems to be talking about why our doctors were prescribing such powerful hormones on such a large scale. "A lot of [doctors] actually believed that estrogen prevents heart disease," says Cindy Pearson, executive director of the National Women's Health Network, a Washington, D.C.-based nonprofit that published The Truth About Hormone Replacement Therapy. "They read review articles and didn't realize that the author had accepted a fee. They went to conferences and didn't realize that the drug companies had inserted slides into presenters' talks. Some doctors got continuing education materials funded by drug companies that make unproven claims." I know there are good doctors out there, but how do we know who to believe? How do we know our doctor is not just "following the crowd", when the crowd seems to be willing to take the easiest route when dealing with their patients? Do we need to demand to see a physician's most recent certificate to feel certain that they are keeping up with the most recent information?